I now reflect upon and synthesise the previous sections based on the past ten years of seeking to innovate curriculum developments within higher education (HE). This is used to establish my claim for a PhD on, “Innovating the development of Work Focussed Learning in higher education“. In particular, this work has had as its core the idea that work can form the basis for learning which can then be accredited by Higher Education and this idea also applies to the creation of this PhD submission as it is based upon my own professional practice of radical curriculum innovation in HE. I have sought to articulate the significance of my work drawing upon a range of theories and concepts outlined in section 2.2. In this concluding section, in particular, undertaking an analysis of my experience through the lens of Disruptive Innovation (Bower and Christensen 1995), explained in section 2.2.4. This concept has been useful in helping me to understand how the similar pedagogical approaches of the Ultraversity and IDIBL Projects have met with different outcomes in their different contexts and why organisations can find it difficult to foster radical innovation. Over the decade covered by this claim, the nature of the research issues I have considered has changed significantly. Initially, my interest was around the pedagogy of online learning and then the development of Work Focussed Learning. Although this remains my primary motivation, I am forced to address the question, systemic change in complex systems – why is it so hard? This is because of the conundrum I face when seeking to understand my practice is why the curriculum model, used successfully in the Ultraversity project at Anglia Ruskin University, proved difficult to implement when reincarnated as the IDIBL and Coeducate projects. These are two quite different contexts, and as such it might be expected that the outcomes would not be exactly the same, however there is I believe much to be learned from the different experiences. My analysis and reflection, using the theory of disruptive innovation, leads me to conclude that there are systemic issues that prevent radical innovation in HE that must be tackled for radical curriculum innovations to be successful, and I illustrate what these might be. in this concluding Chapter 6, analysis of the challenges faced by radical curriculum innovation in higher education. Blackmore and Kandiko (2012, 4-6) argue that the higher education system is globalising at a rapid rate with increasing competition nationally and internationally for students, although the exact impact of this will be institution specific. In addition, they identify the desire by politicians to marketise HE through approaches like the development of league tables and requiring institutions to make available data for Key Information Sets for each undergraduate programme to give the consumers information about features such as contact hours and employability statistics. Further competition is also being promoted through allowing new entrants to the HE system that offer different models of public and private universities (Willets 2011). These factors are contributing to a new context for HEIs in which potentially disruptive innovations are likely to arise, posing a threat to existing models and demanding an appropriate response. Reflecting on my experience over the three projects that form the basis of my PhD claim, the insight that I identify is that the Ultraversity project operated outside of the constraints of the rest of the university working as a semi-autonomous sub group. The IDIBL Framework was by contrast, specifically designed to work within the existing university mechanisms. The contrast between Ultraversity and IDIBL illustrates just how different the model of Work Focussed Learning is from normal university teaching. Reflecting on this further, Table 1 identifies the key functions developed and operated, grouped by business model elements (thesis section 2.2.4.4) and how they differed in the case of Ultraversity and the IDIBL/Coeducate experience. The ones highlighted are further explained. Pedagogical approach Value proposition Work Focussed Learning Work Focussed Learning. In both the Ultraversity and IDIBL/Coeducate projects the aim was to develop the model of Work Focussed Learning for new groups of learners who don’t currently access higher education for the reasons given in Section 4.4.
teaching staff’s conservatism in beliefs and values around pedagogical issues. The belief that exams are more reliable and that quality for undergraduate courses is best assured through delivery of good subject content is challenged by the Work-focussed Model’s requirement for learning facilitators assuring quality through a rigorous process. Taken together, these arguments suggest that there is a strong case for this being an example of a disruptive innovation. The same basic approach having success in one context, but making limited progress in another. This being dependent on existing members of staff already ‘in tune’ with its way of working and willing to accept the challenge, Section 5.8.3. 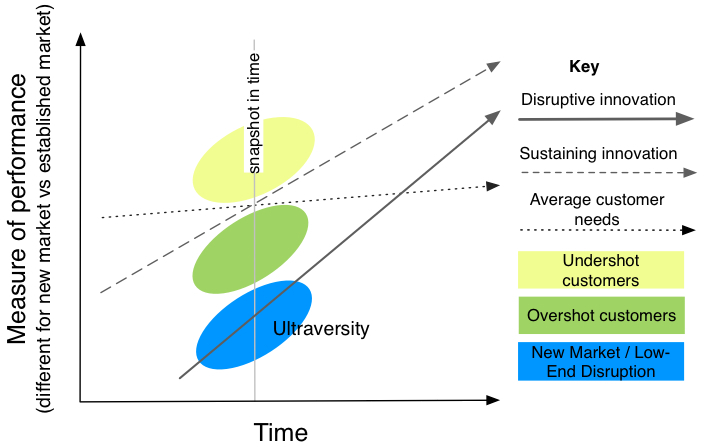 In terms of the Disruptive Innovation theory explained in Section 2, these are very similar new market disruptions both using the same learning model, attractive to new, unserved customers. This is shown in Figure 9, offering lower performance that may be attractive to some customers. The easiest way for an organisation to respond to multiple purposes is through heterogeneity. Different parts of the organization are used to address different needs for different groups (ibid., 256). Policymakers must first address higher-education budget constraints by helping low-cost disruptive universities—public and private—gain market share by eliminating barriers and partnering with them to grow enrolments and capability. These partnerships should foster new models of higher education in autonomous business units separate from the existing institutions (ibid., 42). In the UK context, we are starting to see this kind of action being taken with the changes to funding of teaching in higher education from September 2012, as the government seeks to ease the entry for new private providers and generally introduce more competition into the market (DBIS 2011, 46-53). The validity of the hypothesis ‘work can form the basis for learning, which can then be accredited by Higher Education’ has been demonstrated by the work I have undertaken. This is important to me because I believe that can empower individuals in their work, provide them with academic qualifications and also support the improvement of their work place. During the lifetime of the Ultraversity project, I worked with two other institutions to adopt the model of Work Focussed Learning for their purposes and in different contexts. The Centre For Media Practice at Bournemouth University used the model for the creation of a Masters programme in Creative Media Practice [P10] and, with a colleague, I carried out consultancy work with them to develop their approach and validation documents. The second institution was in Hamilton, New Zealand with Te Wānanga o Aotearoa or ‘Māori University’. There the online aspects of the model were translated to develop a Bachelor’s degree in Early Childhood as the basic proposition of learning through conversation in online communities fitted well with the Maori approach philosophy of learning [P5]. In both cases, the attraction was to reach learners who would find it difficult to take advantage of current face-to-face offerings, and it gives me confidence that the model of Work Focussed Learning can be generalised beyond the specific instance of Ultraversity. This was also the case to a limited extent with the IDIBL Framework in that it was of interest to different audiences as an approach to curriculum development [P26]. However, the challenges in making these ideas work are significant as the approaches required confront head-on the deeply entrenched workings of HEIs. The disruptive innovation analysis has been a valuable one in helping me to make sense of my own experience of curriculum innovation in Higher Education. In my original theory of change around the IDIBL Framework I had given far too much weight to institutional designs to develop employer funded degrees and what were, for me, rational arguments about the value of the IDIBL Framework to the institution, lecturers and potential students. However, individuals make their own decisions about the value or not of a particular course of action based on a life-time of experience, and there was no guarantee that Ultraversity pattern would be repeated. In the case of Ultraversity, colleagues had little experience of working in HEI and consequently, when presented with a course of action, tended to behave as directed until they developed the confidence and experience to increasingly take responsibility. Perhaps better results for IDIBL could have been achieved through seeking to understand the previous history of the teaching and learning regimes and the individuals within them to develop experiences that have a positive reinforcing experience on a greater numbers of colleagues for the changes that I desired. As it was, those who chose to notice the IDIBL Framework were relatively few in number and their achievements, although significant, were blunted. Arguably, in the UK context, the current economic climate and resultant impact on higher education funding will make it increasingly difficult for many individuals to access a traditional university education. I believe that it follows that there is a strong moral and business case for the development of new pedagogical approaches that make it possible for a wider section of the population to participate in, and benefit from a higher education. This belief follows from the philosophical position I outlined in my prologue. For this to happen on a large scale, I believe that new forms of institutions need to be created that are designed from the outset with effective organisational structures, business processes and working practices. The concepts explained by Stafford Beer in the Viable Systems Model, amongst others, in his book Diagnosing the System (1985), offer practitioners, who wish to build such institutions, a way forward. Beer sees effective organisational design as a starting point; this is the foundation upon which other managerial aspects can be built. I arrive at this conclusion because my experience indicates that it is possible to develop and successfully run courses based on new pedagogical models. However, when trying to modify existing institutions the established working practices, assessment and quality assurance mechanisms, attitudes and values, and existing business processes mitigate against innovative developments: the significant challenge is to not let these get in the way of effective learning. It is possible to envisage an institution, taking some of the lessons and ideas identified in my thesis, that is designed in such a way as to maintain rigorous quality assurance mechanisms, but at the same time is agile enough to support new curriculum approaches and supporting business models. Much of this will be made possible by the effective deployment of technology and the design of adaptive systems and processes.